Short Info: The Union Public Service Commission had successfully conducted the Combined Defense Service Examination 2017 on 19th November 2017. A huge rush has participated in this examination. Now, the authority has announced the UPSC CDS I Result 2018. The candidates who have participated in this examination, are able now to check their result. They can check it from the official website of UPSC at upsc.gov.in. Candidates need to visit the official portal with respect to check the result. 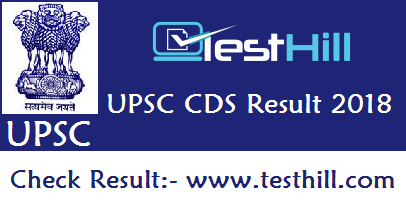 This result is very important for those who have appeared in the UPSC CDS examination 2017. UPSC CDS exam 2017 has conducted on 19th November 2017. his examination was for 414 posts of (IMA- 100, Indian Naval Academy-45, Air Force Academy- 32, OTA Men-225, OTA Women-12. A great number of candidates have appeared in the CDS exam. Now, they all are humbly waiting for UPSC Result. The authority is going to tell the candidates about their achieved score. Candidates are able to check their result by name and roll number in the final list. The final result is displayed in a list in which candidates roll number and names are given. Shortlisted candidates will call for the further selection process. Combined Defense Service Examination is organized twice in a year. It is conducted by UPSC. The UPSC is responsible for appointments to and examinations for all India Services and Group A & Group B of central services. The headquarter of UPSC is in Dholpur House in New Delhi. Its current chairman is Arvind Saxena. the Union Public Service Commission is established on 1st October 1926 as Public Service Commission.